I have been in San Francisco for the past few days. I just got home yesterday. My husband had a business trip and I got to tag along. I had the days by myself and I had a lot of fun exploring. I visited Union Square, Pier 39, Fisherman's Wharf, China Town and Alcatraz. Paul's Aunt Mariesa came in from Woodland and I had a wonderful day with her going to a fabulous knitting shop, Imagiknit and shopping in Japan Town. 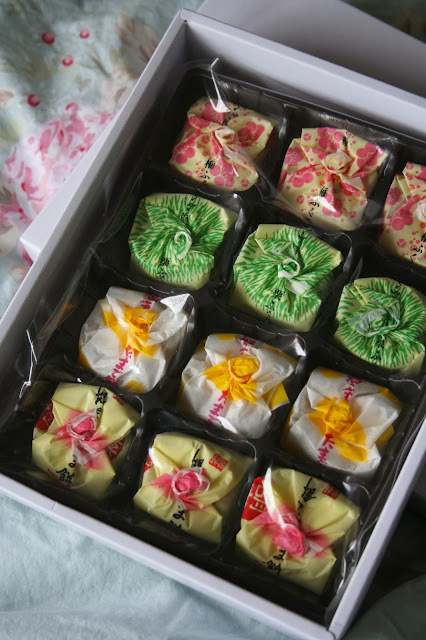 She bought me the gorgeous box of Japanese candy. The candy is wrapped so beautifully that I am going to enjoy looking at them for a while before I sample them. 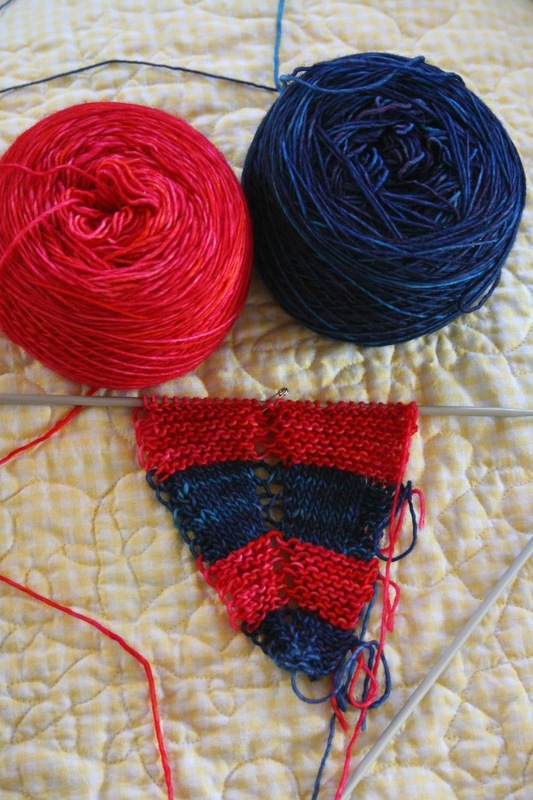 I am doing the "Follow Your Arrow" mystery knit along on Ravelry. We are making a shawl clue by clue. The yarn I chose is Madelinetosh Merino Light in Baroque Violet and Torchere. We just received our first clue yesterday so there is still plenty of time to join in. I also found some wonderful yarn called "Cherry" it has cherries with crocheted stems and leaves hanging from it. You can catch a glimpse of it in the second picture. I came home to find a wonderful present from my longarm quilter/friend, Mary. 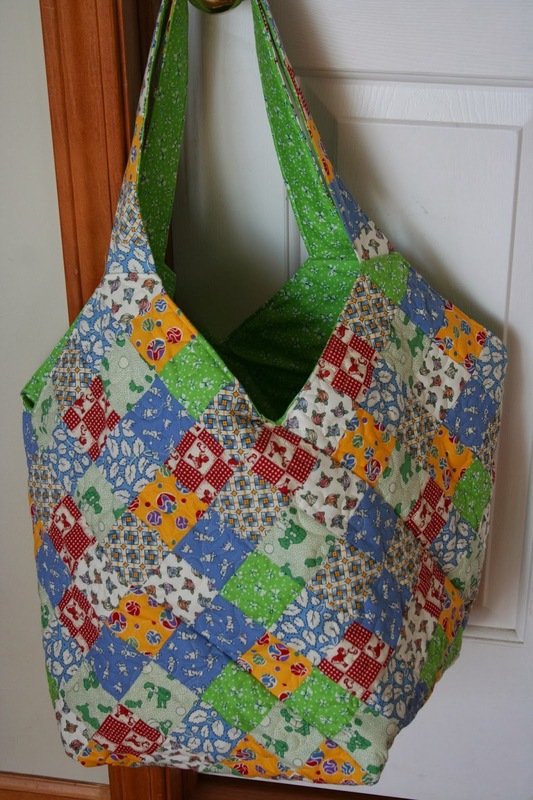 She made this gorgeous bag in repro prints. I was in need of an overnight bag and this will work wonderfully. What a sweet lady she is. I don't get to see her now that we've moved and this gift touched me deeply. Have a wonderful day, friends. The sun is shining and calling me outside - a whopping 34 degrees which lately, could pass as a heat wave! Sounds like you had a great time and a wonderful visit with family. Your bag is to cute. Mary is so thoughtful. 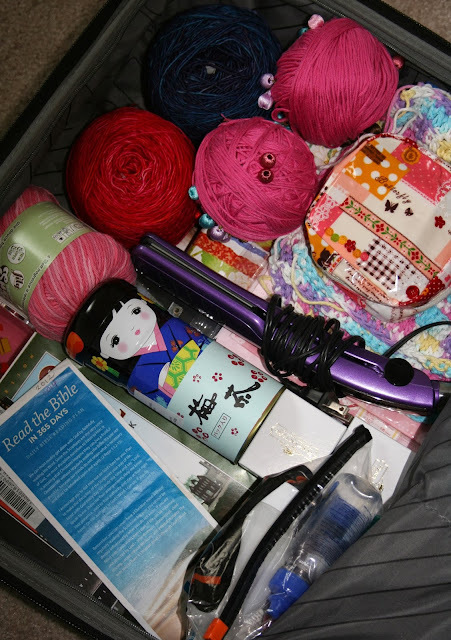 What fun it is to peek into your suitcase and see all the fun things you found, That cherry yarn is just so adorable! Bet you hated to come back to the cold! Sounds like a great trip, how lovely to be able to tag along and explore - and then there's the added bonus of a trip to the yarn shop too! I love the idea of the little cherries on the yarn, and look forward to seeing what you make with it. Lovely bag too, what a delightful gift!